We really, really don’t need a Nor’easter right now. No, really. 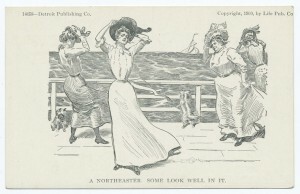 But unfortunately it is that time of year, when the northeast United States and eastern Canada are whacked with gale force winds and bitter cold, a wet and chilling blast that can sometimes resemble a hurricane. 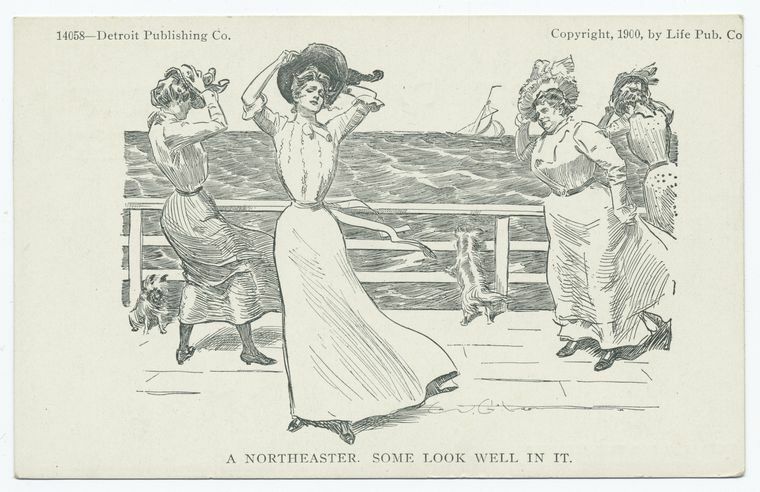 Although the phrase Nor’easter seems like a mangled colloquialism or perhaps something a hip weatherman came with, in fact it’s a mariner’s phrase, tracing back possibly several centuries. 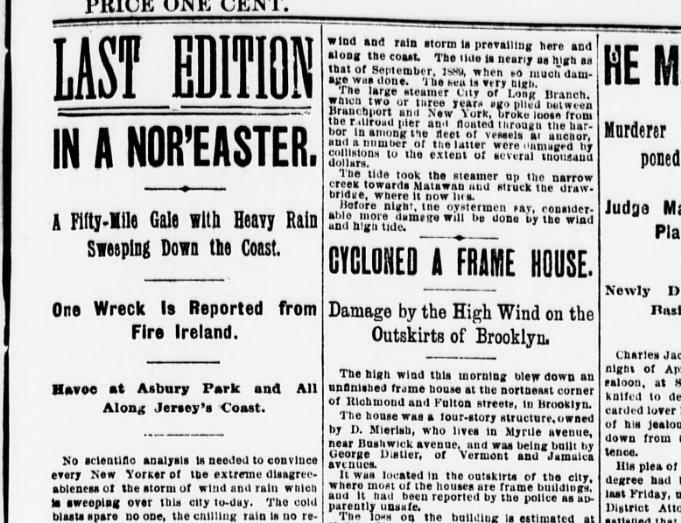 Many devastating blizzards and hurricanes in New York City’s history can be considered Nor’easters, including the Great Blizzard of 1888. Their characteristics can vary. One can bring snow, the next, battering sheets of icy rain. 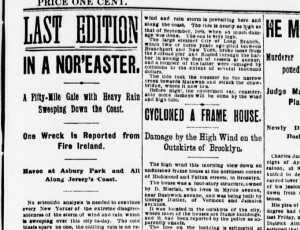 A nor’easter from December 17, 1890 (described in the Evening World headline below) actually brought “a regular Southern cyclone” to Brooklyn, taking out a house in the neighborhood of Cypress Hills, while frozen waves ran a boat aground on Hart’s Island. “A sleet laden forty-knot nor’easter struck New York squarely in the face yesterday,” cried the New York Tribune, regarding a storm that hit on January 3, 1905, fouling up streetcar service and turning streets into skating rinks. The New York subway system, just months old in early 1905, proved a hearty warrior to the weather, while the poor horses above ground began “slipping and falling on the treacherous asphalt.” Even as the subway system gets back to normal this week after Hurricane Sandy, we should remember how relatively sheltered it is from standard storms and a vast improvement over the ground transportation of old.